This article does not cover all species of monkeys, but rather shows the overall groups, subfamilies, and focuses on the more well known monkeys as well as those with unique characteristics. —Macaques: This is the only primate genius outside of humans that is so widespread. This species is most often used for animal testing, especially in the visual system. These monkeys are unsuitable as pets, most notably because the vast majority carries the herpes B virus, which while harmless to the monkeys, can be deadly if given to humans. —Guenons: Another large genius in this subfamily. Most of these are forest monkeys and include the blue, silver, and golden monkeys. The Dryas monkey is severely endangered, with an unknown amount still living, though it’s believed to be around 200 animals. Wolf’s mona monkey is recognizable by it’s interesting colors, yellow cheek whiskers, and pointed ear tufts. 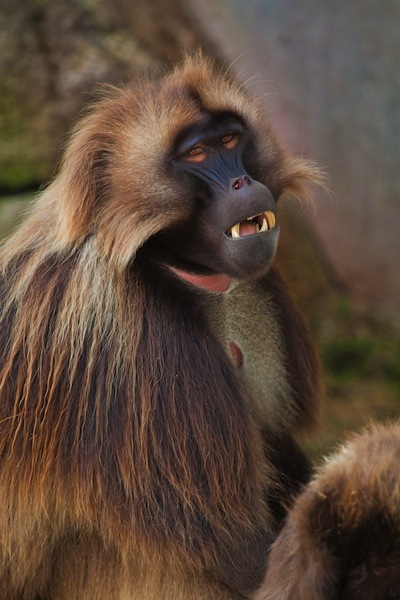 —Baboons: This group of monkeys are the largest of the Old World Monkeys and also forms some of the larger groups. They are notoriously aggressive and usually have a dominant male in charge of the troop. They use a variety of calls, sounds, and facial expressions to communicate. —Colobus: This species and close cousins are found in Africa. They tend to be aggressive and possessive of territory. This species includes the black-and-white, red, and olive colobus monkeys. Most of these monkeys live in trees and forest and contribute to seed distribution. —Langur: These are leaf eating monkeys, and unlike their counterparts, rarely eat insects. They spend almost all their time in the trees where they get their food from, though gray langurs can adapt to other habitats including deserts and mountains. —Odd nosed monkeys: There are several sub-species in this group, but they deserve mention because they have developed uniquely shaped noses. Most of the species have short, stubby noses, but the proboscis or long-nosed monkey has a easily recognized long nose. —Marmoset: The smallest of all monkeys. Usually has twin births. These monkeys don’t have nails like other monkeys, but rather claws. They are very close as a family, with males also being involved in care of young. —Tamarin: Also very small monkeys. These monkeys live mostly in the rainforests in groups of up to 40 animals. Also very family oriented. —Capuchin: Highly intelligent monkeys, often used for research. They show intelligence in using sticks and stones as tools, and rubbing crushed centipedes on their fur as a natural mosquito repellant. —Squirrel monkeys: Called “death head” monkeys in several languages because of their facial coloration. Their prehensile tails are not used for climbing, but rather as a balancing leg. —Night monkeys: Primarily active at night, these monkeys have large eyes for seeing in the dark. They are the only completely nocturnal species of monkey. They also have a wide range of vocal sounds, but are completely color blind. —Titi monkeys: These monkeys are highly territorial and use a number of sounds and body movements to keep other animals away. This species mates for life and can often be seen sleeping close to another monkey with their tails intertwined. —Uakari: Unlike other New World Monkeys, this species’ tail is a lot shorter than the rest of its body. They travel through the forests by climbing or jumping from branch to branch; sometimes taking huge leaps over 15ft. —Saki Monkey: These monkeys live not only in the trees, but also travel and forage on the ground. They use twittering and chirping sounds to communicate. —Howler monkeys: The loudest monkeys in the world. If wind conditions are right, they can be heard for miles around. Very prehensile tails, even using them for picking and grabbing fruits and nuts. —Spider monkeys: This species is threatened and endangered mostly because locals will eat them as they’re large enough. They do have reduced thumbs, but use their tails extensively for climbing and balance. —Woolly monkeys: A very playful species, play is used to bond, form relationships, but also create a pecking order. They not only use a wide range of vocalisations to communicate, but also tactile communication.